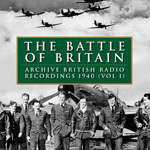 This 76 minute audio CD (and digital download) features broadcast and actuality recordings made between June 1940 and July 1941, and provide a unique insight into the Battle of Britain through talks by pilots of Fighter Command as well as war correspondent dispatches. Eight RAF fighter pilots give contemporary accounts of aerial combat including Richard Hillary, Bob Stanford Tuck, Don Kingaby, G.E.B. Stoney, H.M. Stephen, J.W.C. Simpson and J.B. Nicolson, the latter describing the action on 16 August 1940 which lead to the award of a Victoria Cross. Also included are news reports by Charles Gardner (14 July) and Robin Duff (14 August), the celebrated Midnight News bulletin by Alvar Liddell of 15 September claiming 173 German aircraft destroyed, and extracts from two stirring speeches by Winston Churchill ('Their finest hour...' and 'Never in the field of human conflict...'). Musical interludes the stirring Spitfire Prelude and Fugue by William Walton, written for the film The First of the Few (1942). The booklet features archive images and historical notes by James Hayward. CD tracklist: Spitfire Prelude; Winston Churchill - Their Finest Hour; J.W.C. Simpson - baling out over Worthing; Charles Gardner - air battle off Dover; G.E.B. Stoney - Stuka attack on Dover; H.M. Stephen - five in a single day; Robin Duff - air battle above Dover; J.B. Nicolson - Figher Command VC; actuality - air battle above Crowborough; D.E. Kingaby - the 109 Specialist; Alvar Liddell - Midnight News; unnamed fighter pilot - dogfight with Italian biplanes; Robert Stanford Tuck - fighter pilot; Richard Hillary - shot down; Winston Churchill - Never in the Field of Human Conflict; Spitfire Fugue. Following the fall of France in June 1940, Britain stood alone against Nazi aggression, her army demoralised in the wake of Dunkirk and her navy stretched thinly worldwide. On 16 July Hitler ordered the German High Command to prepare for a cross-Channel invasion of Britain, code-named Operation Sea Lion. Within a few weeks the German navy had assembled a large armada (including 2000 barges) in ports and harbours across France, Belgium, Holland and Germany, with the aim of landing 160,000 troops along a 40 mile beach-head on the south coast of England. The target date set for invasion was mid-September. Whether or not Operation Sea Lion was a feint intended to force Britain to capitulate, it was recognised from the outset that success would depend on the German air force (Luftwaffe) achieving air superiority. The Luftwaffe possessed 2800 aircraft in theatre and outnumbered the Royal Air Force (RAF) by a ratio of four to one, the RAF having already lost several hundred aircraft during six weeks of fighting in France. Moreover German pilots could claim more combat experience, and in the Messerschmitt Bf 109 boasted a formidable modern fighter type. While the Bf 109 outclassed the most numerous RAF frontline fighter (the workhorse Hawker Hurricane), it was matched by the legendary Supermarine Spitfire, the aircraft which has since come to symbolise the desperate air battles of summer 1940. Due to the limited endurance of fighter aircraft in 1940, the battle was fought in the main over south-eastern England. RAF pilots therefore had the advantage of being able to operate closer to their home airfields, and stood more chance of returning to combat if shot down. Moreover they enjoyed the added benefits of effective Chain Home early warning radar, and secret Ultra signals intelligence. The opening stages of the battle in July and early August took the form of Luftwaffe attacks on Allied shipping in the Channel, described here by Charles Gardner for the BBC, and by pilots George Stoney and J.W.C. Simpson. The Kanalkampf (Channel battle) was intended partly to destroy shipping and supplies, but also served to test the strength of RAF defences, and lure British fighters up into a battle of attrition. On 12 August the Luftwaffe began mass daylight raids against RAF fighter airfields and radar stations. Designated Adlerangriff (or 'Eagle attack'), on 15 August all three German Luftflotten launched their heaviest onslaught of all, mounting the largest numbers of sorties of the campaign (1786), but losing 75 aircraft to Fighter Command's 34. The featured recordings by pilots Richard Hillary, H.M. Stephen, D.A. Kingaby and J.B. Nicolson reflect this stage of the battle, as does Robin Duff's report (with actuality recordings) from Dover. Both Hillary and Nicolson describe being shot down in flames. From 24 August to 6 September the Luftwaffe began to target RAF fighter airfields, and the battle entered its critical phase. Several key stations were hit repeatedly, including Biggin Hill, Hornchurch, Debden and North Weald. The surviving pilots were exhausted, losses exceeded replacements, and defeat seemed possible. Fighter Command leaders also clashed over tactics, with Air Chief-Marshal Sir Hugh Dowding (the Commander-in-Chief) and Air Vice-Marshal Keith Park (11 Group) arguing against Air Vice-Marshal Trafford Leigh-Mallory (12 Group) and his 'Big Wing' concept of large RAF fighter formations intercepting the Luftwaffe before they reached Britain. Dowding's defensive strategy won the day, although he would be replaced in November. However on 7 September the German air force switched its attacks from the airfields to the city of London, and night attacks were intensified. This was a grave error on the part of the Luftwaffe and its commander, Hermann Goring. The climatic air battles of 15 September saw 60 German aircraft destroyed for just 27 RAF fighters lost, and faced with deteriorating weather, and an unbeaten Fighter Command, two days later Hitler ordered the indefinite postponement Operation Sealion. The Battle of Britain is generally considered to have run from 10 July to 31 October, during which the RAF lost some 788 aircraft and the Luftwaffe approximately 1294. It was the first major battle to be fought entirely in the air, and on the Allied side was a truly international campaign, with British airman joined by pilots from France, Belgium, Poland, Norway, Czechoslovakia, Holland, Australia, New Zealand, South Africa, Canada and the United States. Film music written by William Walton for The First of the Few (1942), performed by the HallÈ Orchestra and conducted by the composer. Sir William Walton (1902-1983) scored several stirring wartime films, including Next of Kin (1941), The Foreman Went to France (1942), Went The Day Well? (1942) and Laurence Olivier's Henry V (1944). The First of the Few (known as Spitfire in the USA) tells the story of R.J. Mitchell, the designer of the Spitfire fighter, and was directed by Leslie Howard, who also starred alongside David Niven. In 1943 the exhilarating Prelude and Fugue were adapted for concert performance to great acclaim; two years earlier Walton's London home had been destroyed by bombing. After the war Walton found his critical reputation eclipsed by that of Benjamin Britten, but continued to produce orchestral, operatic and choral works. In 1969 he was commissioned by United Artists to score the definitive 'finest hour' movie, The Battle of Britain. However his impressionistic, cerebral music was dropped a month before the premiere, and replaced by more orthodox filmic score by Ron Goodwin. Olivier (starring as Air Chief Marshal Sir Hugh Dowding) insisted that parts of Walton's score were retained, and his intense Battle in the Air frames the four-minute montage of harrowing air combat at the climax of the film (set in mid September). In 1972 the then Prime Minister, Edward Heath, intervened to persuade United Artists to release the full manuscript score to Oxford University Press, and Walton's entire score may now be heard alongside Goodwin's music on more recent CD editions of the soundtrack. A stirring and defiant speech delivered to the House of Commons by Prime Minister Winston Churchill (1874-1965) on 18 June 1940, four days after the Germans entered Paris. "What General Weygand called the Battle of France is over. I expect that the Battle of Britain is about to begin. Upon this battle depends the survival of Christian civilization. Upon it depends our own British lifeÖ Though the fury and might of the enemy must very soon be turned on us, Hitler knows that he will have to break us in this island or lose the war. If we can stand up to him, all Europe may be free and the life of the worldÖ will sink into a new dark age made more sinister, and perhaps more protracted, by the lights of perverted scienceÖ Let us therefore brace ourselves to our duties and so bear ourselves that if the British Empire and its Commonwealth last for a thousand years, men will still say: 'This was their finest hour.'" Flight Lieutenant J.W.C. Simpson (1913-1949) describes air combat over the Channel on 19 July 1940, and his parachute descent lasting 15 minutes. Recorded 6 September 1940. A Hurricane pilot with 43 Squadron (based at Tangmere), on the afternoon of 19 July Simpson's section engaged Bf 109s of III/JG27 off Selsey Bill. After damaging the Bf 109 (flown by Leutnant Graf von Kageneck), Simpson was shot down (probably by Oberleutnant Adolph) and baled out with a bullet in his ankle. After a parachute drop lasting a quarter of an hour, during which the victorious Bf 109 pilot circled and waved, Simpson landed in a cucumber frame at West Worthing, breaking his collar bone. He later flew with 245 Squadron, and was awarded the DFC and Bar. In 1943 Simpson published a short book, The Story of a Fighter Pilot (Batsford), based on his letters to author Hector Bolitho. He was a Wing Commander at the time of his death in 1949. Complete version of the celebrated commentary by BBC correspondent Charles Gardner made while observing a Luftwaffe attack on a British convoy passing through the Straits of Dover. Recorded 14 July 1940. The RAF lost only one fighter during this mid-afternoon engagement (a Hurricane of 615 Squadron flown by Pilot Officer M.R. Mudie), as against three German aircraft (one Ju 87 Stuka, two Bf 109s) shot down by 610 and 615 Squadrons. Gardner's commentary for his mobile recording unit at Hellfire Corner was highly excited, and it's possible that one of the 'enemy' fighters he describes going down was in fact Mudie's Hurricane, which crashed in St Margaret's Bay. Although passed by the censor and broadcast on the nine o'clock news, the sensational tone of Gardner's commentary stirred up no little controversy. Some felt that his tally-ho language, virtually a sports commentary, trivialized life-and-death combat, and one retired major-general wrote to The Times to complain that the piece was an affront to civilized society. However most of the papers thought the broadcast tremendous, and Gaumont British Movietone even secured film rights. Gardner had previously reported from France with the BEF, becoming the first person to record the sound of falling bombs for the BBC. He afterwards joined the RAF and served as a pilot. Flight Lieutenant George Stoney (1911-1940) describes his first air combat against Junkers 87 (Stuka) dive bombers attacking shipping in Dover harbour in July 1940. Recorded 3 August 1940. A Hurricane pilot with 501 Squadron (operating from Hawkinge and Gravesend), former airline pilot George Edward Bowes Stoney was killed on 18 August 1940, after being shot down in combat with Bf 110s over the Thames Estuary. His aircraft crashed near Stile Farm, Chilham. Stoney was laid to rest at St Helen's Churchyard, Sefton, and is remembered on the RAF Memorial at Gravesend. Flight Lieutenant Harbourne Mackay Stephen (1914-2001) describes a remarkable day of air combat on Sunday 11 August 1940. Recorded 15 December 1940. A Scot, Stephen joined the RAF Volunteer Reserve in 1937, and joined 74 Squadron (known as Tiger Squadron, commanded by Sailor Malan) in March 1939. During the Battle of Britain the Tigers flew Spitfires from Hornchurch and Manston, and later Coltishall and Biggin Hill. During the course of three sorties off Dover on 11 August Stephen destroyed three Bf 109s and two 110s, and damaged three further aircraft. One of the highest scoring Battle of Britain aces, Stephen later commanded 234 Squadron and took the unit to Burma. By the end of the war Stephen was a Wing Commander with 23 confirmed kills, and had been awarded a DSO and DFC and Bar. After the war Stephen forged a successful career as a Fleet Street newspaper executive, and was made a CBE in 1985. BBC correspondent Robin Duff describes aerial combat above Hellfire Corner on 14 and 15 August 1940. Broadcast 15 August 1940. As well as graphic commentary by Duff, the recording features actuality of diving aircraft, bombs, machine gun and anti-aircraft fire. On this day Ju 87 Stukas and escorting Bf 109s, as well as Bf 110s, attacked Dover (including the balloon barrage) and were intercepted by several Fighter Command squadrons, including 32, 65, 610 and 615. Some 200 aircraft were involved in the midday melee, in which each side lost two fighters. The following day, Adlertag, would see some of the fiercest fighting of the entire battle. Flight Lieutenant Eric James Brindley Nicolson (1917-1945) describes the action on 16 August 1940 which lead to him being awarded the Victoria Cross, Britain's highest gallantry medal and the first (indeed only) awarded to Fighter Command during the Second World War. Recorded on 2 December 1940, and broadcast anonymously. A Hurricane pilot with 249 Squadron, then based at Boscombe Down, Nicolson was on patrol between Poole and Romsey early in the afternoon of 16 August and engaged several enemy fighters, before his own aircraft was hit by cannon shells from a Messerschmitt 110 at 17,000 feet. As well as wounding Nicolson the shells ignited his gravity tank, yet despite the fact that his Hurricane was on fire he still managed to press home an attack on an Me 110, possibly the same one that had attacked him. By this time the cockpit was a mass of flame, in the midst of which his left hand held the throttle open while molten metal dripped from the instrument panel onto his feet. Before baling out Nicolson suffered severe burns to his hands, face, neck and legs, and landed in a field at Millbrook, near Southampton. On this recording Nicolson omits to mention that he was fired on by an over-excited Home Guard as he descended, and peppered with shotgun pellets. His VC was presented by King George VI at Buckingham Palace on 24 November, although afterwards the reluctant hero refused to wear the mauve ribbon on his uniform until he was reprimanded for being improperly dressed. Nicolson returned to flying in April 1941, and by 1945 had been promoted to the rank of Wing Commander. Sadly Nicolson was killed on 2 May on board a Liberator of 355 Squadron, which crashed in the Bay of Bengal. Although he has no known grave, his VC is on display at the RAF Museum, Hendon. Actuality recording of comments and reactions by a family watching an air battle above the Kent-Sussex border. Recorded near Crowborough, Sussex, in August/September 1940. Talk by Sergeant Pilot Donald Ernest Kingaby (1920-1990), broadcast 28 January 1941. A Spitfire pilot, Kingaby joined 266 Squadron in June 1940, and was posted to 92 Squadron at the end of September. On 15 November he was credited with destroying four Bf 109s in a single day, and on the day described in this broadcast claimed another three. He was awarded the DFM on 6 December 1940 and went on to receive two Bars, the only airman to do so during the war. Between the end of the Battle of Britain and July 1942 Kingaby destroyed another twelve Bf 109s in combat and was described by the press as 'the 109 specialist.' Kingaby was later commissioned and commanded 122 Squadron, and post-war attained the rank of Wing Commander before retiring in 1958. An extract from the BBC Midnight News broadcast on Sunday 15 September 1940, read by Alvar Lidell, announcing that 173 German aircraft shot down that day. The true figure was 60, as against 27 RAF machines. September 15 is traditionally regarded as the climax of the battle, and is remembered annually as Battle of Britain Day. On 17 September Hitler postponed Operation Sea Lion, the planned invasion of Britain. A Fighter Command pilot describes an uneven air battle with 'toy-like' Italian CR42 biplane fighters over the Channel. Recorded 6 December 1940. In a purely political gesture the Italian Air Force (Regia Aeronautica) sent about 200 aircraft to assist the Luftwaffe, operating from bases in Belgium. From their first sortie on 24/25 October 1940 the inexperienced Italian aircrew fared poorly against the RAF, and a quarter of their Fiat Br 20 bombers were lost in two months of operations. The force, always unwanted by the German High Command, was withdrawn to Greece at the end of the year. The action described in this recording is almost certainly the attack by Spitfires of 603 (City of Edinburgh) Squadron on 29 CR42s at midday on 23 November 1940, resulting in seven downed Fiats set against one damaged Spitfire. The Italians' tight formation flying and inappropriate bright camouflage (pale green and bright blue) came as a pleasant surprise both to the RAF and to AA defences on the ground. Tuck wrote in 1965 that he flinched slightly when described as a fighter ace: "The term always seemed to me to conjure up the mental picture of some gay, abandoned, almost irresponsible young pilot leaping into his aircraft, and tearing off into the sky to chalk up victories like knocking off glass bottles in the circus rifle range. Nothing could be further from the truth. Any fighter pilot, after his first combat, is very well aware that air fighting on the scale of the last war was a cold, calculating, cat-and-mouse combat, which required great preparations, lightning reactions, first-class teamwork and above all, cool decisive leadership." Pilot Officer Richard Hope Hillary (1919-1943) describes being shot down in flames several miles off Margate on 3 September 1940, his semi-delirious thoughts while waiting to drown, and his rescue from the sea. Recorded 14 July 1941. A graduate of the Oxford University Air Squadron, Hillary joined 603 (City of Edinburgh) Squadron in July 1940, flying Spitfires from Montrose and (later in August) Hornchurch. He made his first claim on 29 August, but was shot down by a Bf 109 and crash landed near Lympne in Kent, surviving unscathed. At 10.04 on 3 September he had just made his fifth kill when he was shot down by a Bf 109, piloted by Hauptman Bode of II/JG 26. Unable at first to escape the burning aircraft due to a jammed canopy, Hillary suffered extensive burns to his face and hands before baling out over the sea, from which he was rescued by Margate lifeboat. Thanks to his acclaimed, bestselling book The Last Enemy (1942), Hillary is one of the best known of the so-called Guinea Pig Club treated by the pioneering plastic surgeon Archibald McIndoe, and endured several months of painful reconstructive surgery. In 1941 Hillary was sent the United States on a lecture tour, but this was cancelled after it was felt that his disfigured face would do little to encourage Americans to enter the war on the Allied side. Late the following year Hillary finally returned to active duty with 54 Operational Training Unit, but was killed on 8 January 1943 while flying a Bristol Blenheim on a night flight in poor weather. It seems probable that Hillary lost control of the aircraft as a result of icing on the wings, although others blamed his weakened hands. Another signal address to the nation by the Prime Minister, made on 20 August 1940: "Never in the field of human conflict was so much owed by so many to so few. All our hearts go out to the fighter pilots whose brilliant actions we have seen with our own eyes day after day... Although Churchill was no lover of the BBC, of his skilful rhetoric it was famously said that his arrival at the microphone was as good as a new battleship. RAF pilots who fought in the battle have been known as The Few ever since. Credits as track one. Both tracks originally released as HMV C 3359 in August 1943. Recorded in Manchester on 24 June 1943. All ranks specified are correct as at the date of the action described (1940). Some figures for victories claimed have been adjusted in the period since 1940 when these recordings were made.